1. Use products that are earth-friendly and user-friendly. Be concerned and be aware. 2. Look at your lifestyle. Are you being a true steward of the environment both in your business and personal life? Awareness and commitment will help you make long term changes. 3. Are the products you use really "green"? Do the research. This issue will help you. Be aware of greenwashing, companies who aren't really green but are taking one aspect of their product and capitalizing on that. Note the certifications. Ignore personal certifications and pay more attention to 3rd party ones. 4. Determine the VOC count in paints, glues and finishes. You want to keep it under 100 if possible. This will reduce harmful emissions. Look for the VOC counts on labels. 5. Plan ahead. Your products have a lifecycle. Know what it is. If you purchase carpet, you should have a plan in place for when the carpet will need replacement and where the old carpet will be taken. 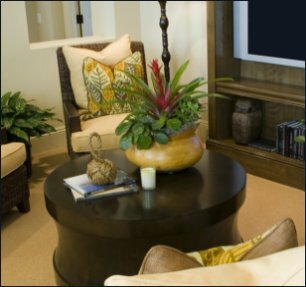 Carpet reclamation services (such as CARE: Carpet America Recovery Effort) are dedicated to this type of service. 6. Insist that your flooring or carpet installer use air machines. They remove the emissions immediately. 7. Note certifications - look for eco-labels and research their certifications. Some recommended ones are: SFC (Sustainable Furniture Council), MTS (Market Transformation Sustainability), LEED (Leadership and Energy Environmental Design), and GreenGuard. 8. Use green foam in your pillows, upholstery or cornices. Green foams or soy bean foams do not contain PBDEs (polybrominated diphenyl ethers). Flame retardants emit harmful PBDEs. 9. Recycle all paper products you use through the Solid Waste Authority. Donate any extra fabric or wallpapers to local charitable organizations. Again, going green is a matter of knowledge and awareness. Once you tune in, you'll be amazed at the number of ways you can turn your home or work place into a green environment that is earth friendly. Go green! Work in the Homes of the Wealthy and Build Your Own Wealth! In a recessionary economy, with so many homes going into foreclosure, many residents are reluctant to spend money for staging services. That's why it's more important than ever to reach the more affluent homeowners in your area. Learn how to tap into this lucrative market and dominate it.